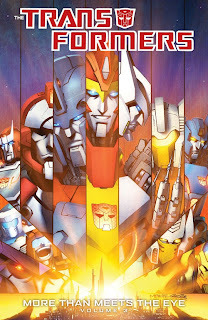 It’s time for my semi-quarterly look at IDW’s Transformers ongoings, with the third volume of More Than Meets the Eye coming first in the reading order. The only downside of this volume from the previous is that the Scavengers don’t appear. The volume makes up for this, however, in that the two stories told are some of the most solid in the series up to this point, setting up future plot points and character development while delivering amazing action and humor. In 2012, MTMTE and Robots in Disguise both had annuals, a sign that the titles had the support of both the fans and the publisher. The annuals tell one loosely-connected story involving the mythology behind the Transformers’ origins, while incorporating their own subplots along the way. Primus, the god of the Transformers, first appeared in 1989, and the stories about him have been constantly modified ever since. With this story, “Primus: You, Me and Other Revelations," James Roberts adds his own spin. There are strong indications that this new myth, involving Primus splitting into five other gods, is just one interpretation of what really happened instead of just being a retcon. For one, this new origin myth is recited by the ancient Cyclonus, who is two million years older than most of the others. For another, it’s told in a fantastic retro art style by Guido Guidi, with added flourishes like Kirby dots and block coloring (a throwback to the early days of the Marvel title and its occasionally lazy color work). The mythology angle is balanced out with other elements, including a look at how other species view the Cybertronians: namely, they’re blacklisted from most planets due to their history of violence. What should be a simple trip to find an ancient spiritual coven of Autobots turns into an incursion into forbidden territory and the near-destruction of the main characters. Oddities surrounding the location result in the revival of dead crew members, leading to a touching moment when Swerve, usually an annoyance, has a conversation with a deceased 'bot who doesn’t know that it’s him. On top of all of this, the super-serious Ultra Magnus is forced to smile to save his life, a plot that seems silly but actually makes perfect sense in context. After this comes the three-part “Shadowplay” story to complete the trade. In the last book, Swerve accidentally shot the psychiatrist Rung. Cybertronians are notoriously hard to kill, so instead of death, Rung has instead lost his brain function, requiring the other characters to tell him a story to restart his mind. Roberts occasionally stretches to connect the franchise third-stringers who populate MTMTE into one coherent story, but a cutaway gag to other storytelling sessions aboard the ship excuses the coincidences. The sessions are led by boisterous researcher Rewind, and Roberts reinforces the clearly romantic relationship between him and Chromedome through their mutual concern and occasional flashes of jealousy. Gender doesn’t exist amongst the Transformers in the IDW-Verse (females are deliberately-created anomalies), so it’s not really a “gay romance," but it’s a risk that I’m glad was taken in this title. Chromedome, Ratchet, Skids, Drift, and Swerve, amongst others, recount how Orion Pax -- later Optimus Prime -- averted a bomb threat which would have resulted in the Decepticons being seized and lobotomized en masse. Mini-series such as Megatron: Origin and Transformers: Drift, along with the “Chaos Theory” two-parter from the old ongoing (issues #22 and #23) established that the Decepticons were not thoroughly evil, but were instead a group of angry workers who succumbed to darker influences. Cybertron before the war was a world where a citizen’s alternate mode determined their place in society . . . with cruel punishments if one tried to change that. Roberts uses alternate modes instead of race as the main source of discrimination amongst the Cybertronians, which connects to his ongoing theme of the strangeness of their biology. Much of “Shadowplay” is a police procedural following Chromedome, who was a cop before the war, and Prowl, who here is a neophyte but still cold and brilliant. Orion Pax wouldn’t become Prime until quite a bit later, but we get to see the start of the classic Autobot roster, along with appearances from fan-favorites like Red Alert and Last Stand of the Wreckers’ Ironfist. Skids’s role comes from his time at an academy for Cybertronians with special abilities. Roberts uses the Academy as a shout-out to the X-Men, with the students hated and feared by normal Autobots. The leader of the Academy, a senator who helps Orion Pax, goes nameless throughout all of his appearances until he is tortured by having his mind rewritten and his head and hands removed and replaced with a cyclopic eye and a gun arm. If you know anything about the franchise, then you know who I’m talking about, and it’s a reveal so powerful that it’s changed the power rankings in the Decepticon ranks forever. Like I mentioned in my review of RID Volume 2, this is the one of the biggest synching-up point of the two titles, which will lead to the “Dark Cybertron” crossover coming up later this year.